Made to surpass the highest UL Boat Cable standards with ultra flexible (Type 3/Class K) stranding to resist fatigue due to vibration and flexing. Outer jacket is made for easy removal and provides the best abrasion resistance available. Ancor's proprietary premium vinyl insulation stays flexible even in extreme cold and resists salt water, battery acid, oil, gasoline and ultra-violet radiation. Exclusive insulation is rated at 600 volts. 105 degrees Celsius dry and 75 degrees Celsius wet. 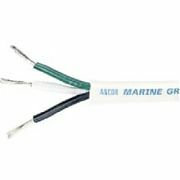 inner conductors are correctly color-coded to ABYC standards. Black/Green/White.